With spring almost on our door steps and summer following shortly thereafter there are some homeowners beginning to think about the possibilities of remodeling their home or making improvements to their property. If you ask a contractor, spring and summer are the best months of the year to complete the work. The days are long the weather is nice (usually) and that allows for many consecutive hours (or possibly days) to be focused on the individual projects at hand. There is a shortfall when remodeling your home in the spring and summer months though, and that’s if you decide to wait too long to schedule. As many homeowners find out every year you could find yourself waiting well into the fall or even winter maybe even possibly the next year to get your remodeling project completed. The local contractors who do great work and have a great local reputation will almost always be booked ahead of time and with full schedules running right through summer it can be tough to squeeze new projects in depending on their scope and size and sometimes it’s just impossible. The sad part of this is, many homeowners will end up booking the contractor that is available. While not necessarily a bad thing, it doesn’t always mean you’ve chosen the best contractor. So what is the moral of the story? If you’re planning on doing any of these suggested home remodeling projects this spring or summer make sure you book your chosen contractor early! 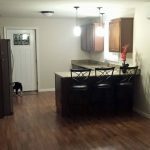 Now that we’ve gotten that bit of information out of the way let’s discuss some of the most common home remodeling projects someone might want to complete on their home this year. Do you have too many toys scattered around your property? A boat? Maybe yours and the wifes cars? Do you have a need for additional storage space? Maybe even an additional living space. If you’ve got the space on your property then a detached shop or garage can solve all of your secure storage problems. A common addition to any shop or garage is often a secondary living suite above the shop. In fact, this is becoming a pretty common living arrangement and very popular with home buyers. You have the benefit of secure storage for your vehicles and toys and you also have the benefit of extra living space and even rental income if you are renting the suite out. The specific zoning laws in your area will dictate what can or can’t be built and what the specifications will need to be, but this is again why you choose a great contractor right from the start. The NAHB did a study of home buyers in 2013 and found that for 32% of home buyers a Garage was a “must have” for their purchase. 54% of home buyers rated Garages as a desirable extra but they could live without it. When a homeowner has access to a garage on their property, they would probably tell you they could’t own a home without one. How Much Will It Cost To Build A Shop or Garage? We know it’s on every homeowners mind when they start a project like this and you want to know what it’s going to cost you? We can’t tell you over the Internet or through our Website what building a new shop or garage will cost on your particular property without viewing it and consulting with you first. However, if you want a general cost for construction a very basic detached garage might start at around $55 per square foot of finished space. How Long Will It Take To Build My New Garage? 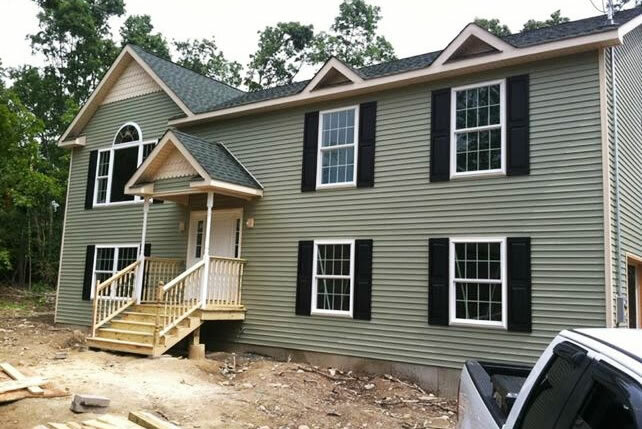 If you’re booking a contractor to complete this work in the spring or summer when the weather is nice and working conditions are favorable then we can finish most shops and garages in just a few short weeks. This is counting on you having an appropriate build-site that is ready-to-go and a floorplan that is not too complex. We’re talking about your basic rectangular garage with a standard pitched roof. It’s ok if you don’t have the plans finalized, or if you need help determining a building site and all the permits or licensing required. Your contractor will be able to help you with these specifics. 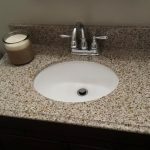 This is probably one of the most popular home remodeling projects for the spring and summer months. Most homeowners will want their deck completed in the spring so it can be enjoyed for the summer. The last thing you want is to have your new deck built and ready-to-go for October. That wouldn’t be any fun! So again, we’re going to remind you that if you plan on building a deck this spring/summer you need to start getting that ball rolling. Get in touch with a local contractor and they can help you begin planning out the project. How Much Will It Cost To Build A New Deck? There are just so many variables that come into play with construction projects, even as simple as a deck. These all affect the time required, sometimes the materials and ultimately the final cost. For example where are you planning on building the deck? Is it going to be off your back door and into the backyard? Or will it be surrounding your pool? Maybe you want the deck to wrap right around your house? What type of materials do you want to use? Will it be affordable and economic pressure treated lumber or a more expensive composite or the most expensive exotic woods like Ipe or Cedar? What shape is it going to be? Do you have a hot tub or BBQ that might need to be accounted for? Do you have other landscaping or property preparation that needs to be completed first? Now you can see why we don’t give prices out over the Internet for a new deck! It’s just not very accurate and actually a disservice to the homeowner because for the best answer you really need to have a pro come out and look at your property, take some measurements and consult with you on what your vision is. How Long Will It Take To Build My New Deck? 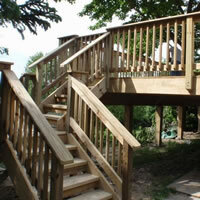 In the springtime decks are something a good contractor with an experienced crew can build in fairly short order. As in a few days, maybe a week or two depending on how large or complicated the project might be. One thing is certain though. If you wait too long to book your contractor you’ll find yourself out of luck with the best builders in your area as they’ll be booking up right about now for their springtime work. While not the most glamorous remodeling project one could do new windows actually carry great benefits, much more so for older homes with inefficient or poorly installed windows. What would be a poorly installed window? Well if you can see gaps to the outside along the window framing then that’s generally a bad sign. With so many window installers out there not everyone takes their time with an installation to make sure it’s done correctly. There are many outfits that cut corners and take shortcuts which unfortunately leaves the customer with poor home heating and cooling performance because much of your homes energy is being spent on heating or cooling all of Wisconsin! The NAHB did a study of home buyers in 2013 and found that energy star rated windows were an “essential” must-have for at least 35% percent of home buyers. 54% said they viewed energy star windows as a desirable item but not essential to their purchase decision. With figures like those, if you plan to sell your home having modern energy efficient windows installed could help you sell your home faster. If you don’t plan to sell right now at least properly installed energy efficient windows will make your home more comfortable and can help to reduce your home energy bills. How Much Will New Replacement Windows Cost? B: The Time Required To Install It Correctly. (roughly 2-3 hours of installation time each window. Replacement windows are generally a fairly straight forward remodeling project if careful measurements have been taken for the replacements. This is why anyone who installs windows professionally with a good reputation will often lay it down heavy on the consumer about the quality of their installation. While it might seem like a sales pitch don’t brush this off! The quality of a window installation is the most important part! If a contractor is taking the time to explain to you the specifics of how your window will fit, operate and seal the inside from the outside you should listen to what they have to say. The great window contractors take pride in the quality of their window installations because with a quality installation (proper installation) the energy efficient windows actually do the job they were intended to do. How Long Will It Take To Replace My Windows? If you estimate the time required to properly install your window at 2-3 hours then you can multiply that by the amount of windows in your home to get a rough idea. 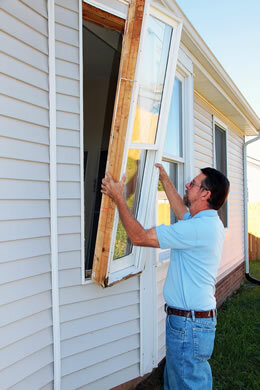 Generally we can replace all the windows in a typical Wisconsin family home in a day or two. Generally the hold up, if there is one will be waiting on the windows to be manufactured if you’ve chosen custom styles or you have uncommon sized openings in your home. Why Would You Book Star Remodeling For Your Home Remodeling Projects? When you choose Star Remodeling you’re choosing a local Orange County, NY contractor that is licensed and insured to operate in our area. With our owner/operated business model and the fact that we maintain a small crew with very talented craftsman means that quality and customer satisfaction is always paramount. We strive for 100% customer satisfaction on every project we work on. To us, there is nothing that validates what we do as much as a word of mouth recommendation from a homeowner who has put their trust in our services and was thrilled enough with the results to share us with others. You want to make your home a better place and we want to help you do it! Which Areas Of Orange County Do We Provide Our Home Remodeling Services? 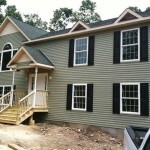 We provide our home remodeling and construction services to the following areas of Orange County, NY. If you don’t see your area listed here don’t hesitate to call us if you are still within an hours drive of our home base in Walden, New York. If you’d like to have the pros at Star Remodeling come out and provide an estimate for your spring or summer project then please give us a call at 920-763-5779 or fill out the email form and we’ll get right back to you.